The Military Macaw (Ara militaris), is a medium sized member of the macaw family. It is found in the rainforests of Mexico and South America. There are three subspecies of Military Macaw, namely ‘Ara militaris militaris’, ‘Ara militaris. mexicana’ and ‘Ara militaris boliviana’. 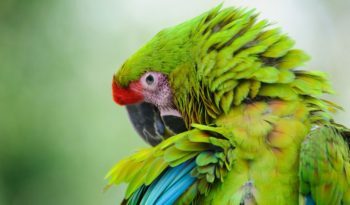 The Military Macaw is mostly green in colour with the head a slightly paler shade. It bears a red frontal patch, with a white bare facial area barred with narrow black lines. The flight feathers are blue and the red tail bordered with blue. The large strong beak is grey-black and the iris is yellow. Military Macaws can often be heard long before they are seen. They are a very noisy bird making a variety of loud cracking and shrieking sounds, including a loud ‘kraa-aak’. The Military Macaw generally measures 70 – 80 centimetres in length. The military subspecies is the smallest and the mexicana subspecies is the largest. The Military Macaws diet consists of seeds, fruits, nuts, berries and other vegetation found on treetops in the rainforests. 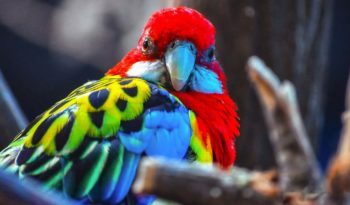 Their beaks are well adapted for eating various seeds and nuts as they have the ability to break open the hardest of shells with relative ease. Military Macaws will leave their roosts in flocks around dawn and head to their feeding areas. 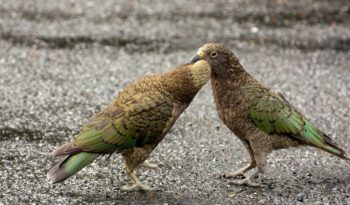 They will also visit heaps of clay known as ‘macaw licks’. These clay licks are found along riverbanks or sometimes inside the Amazon rainforest. Macaws will flock to feed on these clay deposits, which appear to detoxify the poisons found in the seeds and vegetation of the rest of their diet. 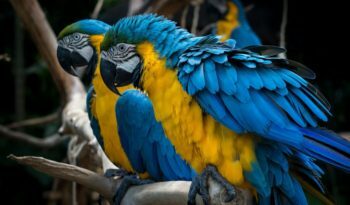 The three subspecies of Military Macaw breed at different times. However this probably has more to do with the geographical region they are residing in than anything else. Breeding in the militaris species occurs from January to March. The mexicana species breeds from April to July and the boliviana species breeds in November and December. Military Macaws are monogamous and remain with their mates for life. As they fly around in large flocks, the mates/pairs will fly together. They will also be found flying in pairs in their feeding and roosting/nesting areas. Females will lay one to two eggs which only she will incubate for a period of approximately 26 days. 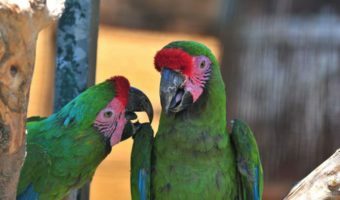 Military Macaws will reach sexual maturity in two to four years. Military Macaws live in large flocks and can live around 50 – 60 years in the wild. The Military Macaw inhabits arid woodlands and subtropical forests. They will nest in the tops of trees and more often in cliff-faces over 600 feet. (200 metres) above the ground. The three subspecies of the Military Macaw are distinguished geographically. The ‘Ara militaris militaris’ are often found in areas of Peru, Ecuador, Colombia and Venezuela. The ‘Ara militaris mexicana’ occupy areas in Mexico and the ‘Ara militaris boliviana’ live in Bolivia and Argentina. 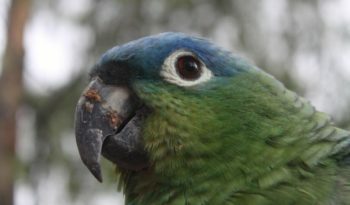 The population and distribution of the Military Macaw has been decreasing over the past fifty years. The abundance of the Military Macaw has now decreased to less than 10,000 globally. This decrease is mostly due to deforestation and the capturing of wild birds for the pet trade industry. Military Macaws are now listed as Vulnerable on the 2006 IUCN Red List Category. They are also listed as CITES (Convention on International Trade in Endangered Species of Wild Fauna and Flora) Appendix I, which protects the birds from being captured for trade.